Palm were rumoured to have something up its sleeves for CES, and the rumours didn’t disappoint. Palm’s latest device – the Palm Pre sounds like a beaut. It sports a 3.1-inch portrait touchscreen, a QWERTY keyboard that kinda curves out as opposed to sliding out, a screen resolution of 480 x 320 pixels, removable battery and 8GB of on-board storage. You won’t need to worry about internet connectivity as the Pre is packing it by the bucket load – WiFi, Bluetooth and EVDO. As well as all the above, there’s a 3 megapixel camera, microUSB port, 3.5mm headphone jack (no proprietary headphone jack for this bad boy) and a nifty wireless charger. 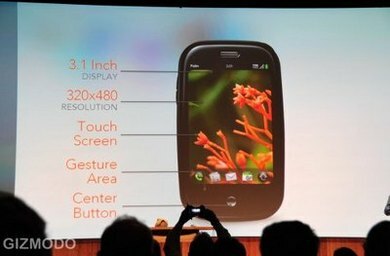 It also runs Palm’s new OS – Nova – which you can read about here, and is tipped for release in the “first half” of 2009.